A BBC News report from Ark Royal as she conducts her final contractor sea trials before arriving in Portsmouth for the first time. A BBC South Today report covering Ark Royal arriving in Portsmouth for the first time. A BBC South Today report covering the Commissioning Ceremony of HMS Ark Royal in the presence of Her Majesty Queen Elizabeth, The Queen Mother at Portsmouth Dockyard. A TVS news report covering the Commissioning of Ark Royal in the presence of Her Majesty Queen Elizabeth, the Queen Mother in Portsmouth. 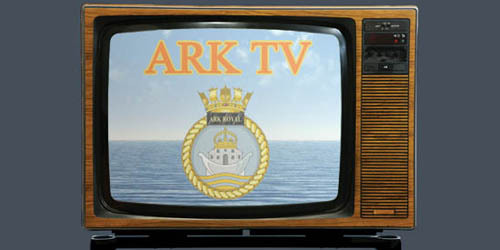 Filmed on Ark Royal in Gibraltar in 1986 for broadcast on Christmas Day that year. Sadly, copyright restrictions prevent us from showing the actual musical performances, but all of the links that feature the Ship's Company are here. Presented by Sue Robbie. Filmed on Ark Royal in Gibraltar in 1986 as part of Ark Royal The Rock Show. Filmed in November 1989 by Yorkshire TV, it shows what a day is like aboard Britain's premier warship.